ALLEN, TX – Texas continues to lead the way in women’s wrestling, as evidenced at this past weekend’s National Collegiate Wrestling Association’s (NCWA) Women’s National Championships held in Allen, TX. Twenty-three women from the eleven schools in the Southwest Conference entered the tournament, accounting for nearly a quarter of the seventy-nine total entries. Eleven of them went home with All-American honors. Alexis Perez of University of North Texas and Luciana Schement of University of Texas led the way for the Conference, each finishing in second-place in their respective weight classes. 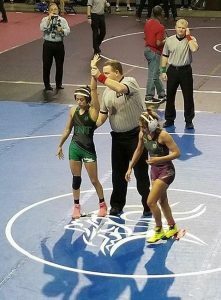 Perez was seeded second in the 101- pound weight class, and pinned her way to the championship finals where she took on three-time returning NCWA National Champion Samantha Frank of the University of Maine. The women’s 101-pound championship final was one of two women’s championship highlight matches conducted on the main stage of the tournament. Frank wasted no time in throwing Perez to her back, and quickly closed out the match with a pin-fall at 0:31. Fourth-seeded Schement pinned her quarter-finals opponent, and then proceeded to upset the number one seed, Marie Seely of Southwestern Oregon Community College, by a 9-5 margin of victory. Schement hit a textbook double-leg takedown in the first period of her semi-final match against Seely, and then went to work on top. She would employ the same double-leg takedown-to-ride strategy twice more in the match before advancing to face Katlin Wells of Springfield Technical Community College in the championship finals. Schement secured the first takedown in the championship match, but those would be the only points she would muster, failing to escape Wells’ vicious top-ride and losing the bout, 14-2. Three Southwest Conference teams finished in the top ten in the team standings. The University of North Texas led the way with a fourth-place finish, amassing 43.5 points. UNT entered three women in the tournament, and each took home All-American awards. Richland College followed in fifth place with 34 points, and first-year women’s program University of Houston finished ninth with 20.5 points. District 8 – 6A, one of the Toughest in State?